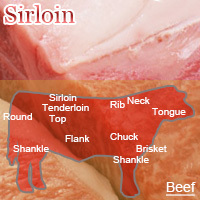 Beef sirloin is prime for steak. In addition, comes in handy when making a roast. It is used primarily for making steak. Eating sirloin steak dressed in onion sauce is popular. The calories in Beef Sirloin per 100g(1cut ) is 298 calories. Beef Sirloin is calculated to be 298Cal per 100 grams making 80Cal equivalent to 26.85g with 23.7g of mostly fat、17.4g of protein、0.4g of carbohydrates in 100g while being rich in vitamins and minerals such as Niacin and Vitamin B6.